PDF reprint of a 38-page USDA Farmer's Bulletin. There was a time when the U.S. government encouraged families to live on a small section of rural land and provide for their own food needs. This 19-page Farmers Bulletin presents a practical plan for a family of five to do just that. The assumption was that a basic subsistence homestead of one acre could be worked by hand and cared for by a father with an outside job, working in his spare time, with the help of his family. So there would be some off-farm income to help pay for necessities beyond what the family could provide for itself. There was no assumption of earned income from the homestead, especially one of that size. The one-acre subsistence homestead plan only allows for the production of fruits, vegetables and poultry for the family itself (not for outside sales). But if the father (referred to as an “employed man”) is only employed part-time or has a larger family, the bulletin discusses what more can be done to support the family (i.e., a family cow or milk goats), and how much land is needed for each option for expansion. “Growing food for family-living purposes in connection with enough outside work to provide the family with the cash for necessary farm and family expenses is a combination that many families now want to develop. Recent hard times and still more recent Government policies have renewed an intensified interest in this possible combination. This kind of farming has often been called subsistence farming and a farm of this kind a subsistence homestead. 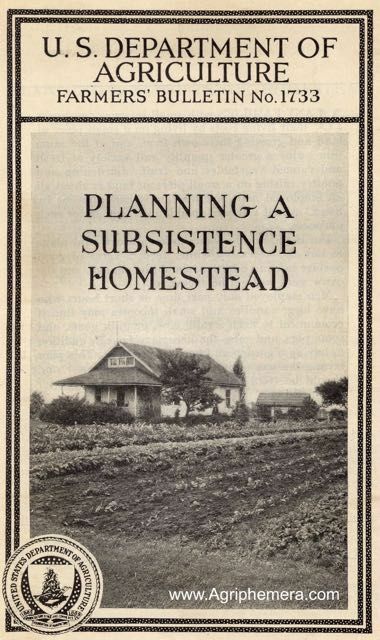 A lot has changed since 1934, but I think this concept of a subsistence homestead is still practical, and much of the information in this bulletin is useful and applicable to the undertaking, especially the discussion of what can (and can not) be done, practically speaking, by a family on a small section of land. From a more modern perspective, the whole concept of having a subsistence homestead, as this bulletin describes it, is still valid. In fact, with the advent of the internet, and the many new options for working from home that the internet provides, I think it is entirely possible for fathers and mothers to be self-employed, at home, with their children, on a small section of land, and have an even more desirable subsistence homestead. It’s not necessarily an easy goal, but I happen to think it is a worthy and rewarding goal, and the information in this bulletin provides some useful information towards achieving that goal.